Welcome to the Moda Blog tour!! !…I am Lisa Bongean of Primitive Gatherings…I’m glad you stopped by…I have been a moda designer for a couple of years now and I truly LOVE it!! I design under Primitive Gatherings which happens to be the name of our quilt shop in Menasha, WI… that is by Appleton. We have a beautiful shop, my studio is in our warehouse and we also have a retreat house right down the road, so come visit if you are ever in the area! Look for workshops and retreats coming in 2015! I LOVE being home…you should come see me! Tell us about your first quilt. My first real quilt is a blue and cream star quilt…It was from an American Patchwork & Quilting magazine… It is hand quilted…I really didn’t know what I was doing but It turned out and I didn’t give up on it…I have a 1/2″ binding…the quilting is a little quirky…but for my first completed real quilt…I LOVE it! border cable with 1/2″ binding..
What fuels you to create? I just love to see what I can make with my hands..I can see it in my head and it is amazing that I actually can make it happen! I love math…but being creative, organized and keeping all those numbers straight sometimes can be very overwhelming! I LOVE what I do…and have a hard time know when to hang it up for the day…so I guess that means I am doing what I am supposed to! What is the best part of your design process? The best part for me…is making all the choices…what fabrics to use….should I set them “on point” or straight…should I make big blocks or make them as tiny as I can…I LOVE being in control of any and all of those decisions! I love the color……Right now my favorite color to work with is Moda…anything Moda…but seriously…I used to not care too much for the color white…you never saw me create with white…but somehow, maybe because I am older or should I should say mature, it has grown on me…I like being able to create homey warm projects with my normal “white” which is tan. But as of late…I am using some white… it is nice to be more versatile…more current or if I wish to or go back to a more vintage style I can…so I guess what I am trying to say is…it good to have more choices. When I teach classes or workshops, I love…..Teaching my students all the tricks…I remember what it is like to be in quilt class and how exciting it was…My intent is to inject them with excitement and be confident with the skills I have taught when the class is over. I want them to LOVE this as much as I do! For my quilt project I chose the mini charms…partly because I did not have my fabric line to work with yet…so we had to use Homestead Gatherings…which is good…cause you can make this right now!!! It takes 2 mini charms and probably a yard of primitive muslin. We only used the reds, greens, blacks and browns…we saved the lights for the back…So if you are following the pattern use the Primitive Muslin as your light. We then bordered the 12″ block with a 4″ wide border. Piece the remaining light mini charms…add some primitive muslin squares also to make 64- 2 1/2″ squares needed for the back. You will also have to border this too. I would put a 6″ border on the back. If you need to order Homestead Gathering precuts you can do so here: PRECUTS If you need to order Primitive muslin…you can do that here: PRIMITIVE MUSLIN We used Paper Bag 1040-24. Our little quilt finished 19″x 19″ after quilting. If you wish to be entered in a drawing for this Fat 8th pack of Lakeside Gatherings please leave me a comment on this post, and make sure you go visit all the other designers to win there prizes as well, see below for links! Well I hope you are all enjoying this tour of blogs…Good luck and I hope you win a prize!!! Wow! Love the wide border and quilting. Gorgeous small quilt! Lisa, I love your new fabric line!! Thanks for letting us get to know you better. Love the pop of yellow thrown in with all the black and grey! I love your new fabric line. Thanks you for all of your designing efforts. Just love your patterns. Love, love, love all things Primitive Gatherings! Can’t wait for the new line. Thanks for being so creative. Moda fabrics are so nice! I do like the whites to blacks with a pop of yellow in them. How fun it would be to win this. That star quilt is just beautiful! I love all the handstitching. Thank you for a fun blog hop. Love these fabrics. Thanks for a chance to win. I like seeing you version of the quilt using the mini charms. The new fabric line is wonderful. Can’t wait for it. The quilt with the anchor is wonderful. I love FQ or F8 bundles too. Thanks for your inspiration. The new line is just beautiful. I really like your star quilt. I just love the look of old style hand quilting. Can not believe that star quilt was your first quilt, incredible. Love your little mini quilt. Thanks for the great giveaway. Fabulous post and love all these quilts and your new line is an eye candy!! My first quilt was a small sampler quilt with six 12x12inch blocks.I usually buy FQs and charms.Thanks for the fun! this is so pretty with the mini charm. Love your new fabric line – right up my alley. I’m seriously impressed with your first quilt! Thanks so much for the chance to win some of this lovely fabric. Love the quilt made out of mini charms, I am starting to do some hand quilting and love the process. Your new line has a really different look for you! And, yes, I would love to see how it works in the Moda pattern too. Love the anchor! You definitely have found your calling!! A true natural of the art. Love your quilt designs and fabric lines. Thank You for all your inspiration!!!! Love your new fabric line and thanks for showing you did with the blog hop block. Lovely!! Love love love the new fabric!! Thanks for the chance to win !!! I took my first class with Lisa this summer in Michigan she is a great teacher and has a sense of humour !!!! Plus she is a fabulous designer! I love your new fabrics, can’t wait to see them in real-time! I’m impressed with how good your first quilt looks – especially that hand quilting! Obviously you are doing what you were meant to do! Love all of your fabric lines and can’t wait to play with this one! Love your designs and creativity. Can hardly wait for the new fabric line to come out. Love your fabrics. Have all of them! Love your fabric. Thanks for the give away. When l read about your excitement teaching and inspiring others, l could relate. l teach workshops and do demos for the 2 guilds l belong to. l LOVE, LOVE, LOVE being able to show a new pattern, technique , or trick to my cronies and have them get the “fire in the belly” as was once described to me by a wonderful teacher l had many years ago. lt is a blessing for all of us to have one another and a love of quilting to share forever. I would love to win anything you design, thank you for a chance to win. I tried hand quilting years ago on a quilt for my daughter. However I never got a chance to finish it and it still sits on the top shelf of my closet. 25 years later she still rminds me I need to finish it!! Your fabrics are always beautiful, and so are your patterns! I’m the “opposite” of you … I used to use white, but now my “white” is tan. 😉 Can’t wait for your new fabric line … love the plaids! Love your fabrics and patterns. Just was at your booth in Madison. Always one of the best. Can’t wait for the new line! I would love to spend a day with YOU and get some tips on working with wool. I’ve done several of your kits but I’m sure you could teach me a lot!!! Looking forward to seeing you in Houston. I loved reading your answers to the questions and think a brainstorming session with all the designers is a great idea! Would love to come to a retreat some day. Thank you for the opportunity to win some of the yummy grey and yellow in your new line. I love the new fabric line and the nautical quilts! Your first quilt was inspiring-I am impressed!!! It sure doesn’t look like MY first quilt! 😦 I also LOVE your little mini quilt. It would be so cute to make for X-mas. 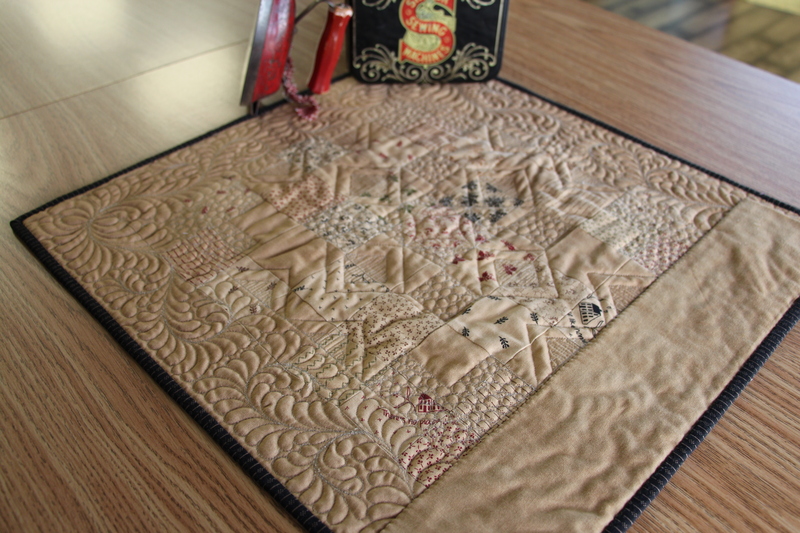 Thank you for the beautiful pattern and for sharing your quilting story. Your fabrics are beautiful! would love to win some, thanks for the giveaway! LOVE the grays and yellows! I so enjoy your blog, projects, and store! Thanks for the chance to win! Love the anchor in the star quilt, beautiful! Always love your patterns and your fabrics. Thanks for the giveaway! A beautiful bundle; love the fabric! You are si inspiring! Cannot wait to see your new line of fabric! Love your 1st quilt, we were all there at one time, it’s only up from there. I also love the new line can’t wait to get it. What a sweet little quilt. Can’t wait till December for the Lakehouse fabric! Love it. I just love the anchor quilt. It would fit right in at our lake house! Morning Lisa! The mini quilt is sooooo cute…a great table topper. Your designs are amazing, I have unopened kits in my stash just waiting patiently! Your blogs always seem like they come from a friend…thanks for sharing with all of us. Anxious to visit your place one day! I love the itty bitty scale of your collections’ designs. Your new collection looks gorgeous – I am loving the tranquil colours. I LOVE your mini quilt with the beige background fabric. Thank you for a giveaway chance with your new fabric line. I love the soft yellow in with the blues/greys and other colors. What beautiful fabric. I love reading your answers to all the questions! And I can’t wait for your new line to come out. I want to do my bedroom in gray and yellow so I am looking forward to making the quilts you are working on for your new line. It is perfect! I like the quilt design/fabric. It would look nice on one of the walls of our cottage on the lake. I love the mini charm version. I am trying to do more smaller projects in between the big ones. It feels so good to finish. The new line is so fresh and clean. Look forward to working with it! Love your new fabric line. Your pattern are wonderful!!!! I too love the fat quarter stack! Your Lakeside Gathering fabric colours look wonderful. It is nice to see some fabric colours other than Aqua and pink! Love your mini quilt using the mini charms. Also a great idea using the remaining charms for the backing. Wowsy! I was talking to your son at a quilt show earlier this year and he told me you were working on a nautical line. I have been waiting and waiting to see what you designed and I absolutely love it! Although, I love everything you do. Love the colors and prints in Lakeside Gatherings! Looking forward to making a big enough quilt to snuggle in while enjoying a crisp autumn morning on the back porch. I have purchased bundles of all your fabric lines. I can’t wait for this new one to be available. I’ve fallen in love with all your fabrics and designs. There are not enough hours in the day to do all the projects I would love to do. I’m trying though! I love the fabrics you have. Love the wools as well! Of course; we all love this!! It is Primitive Gatherings from Lisa. I can’t wait to get my hands on the new line! The colors are amazing. Waiting is hard! In the meantime I just keep begging for you to come to Colorado! your first quilt is BEAUTIFUL!!! I’m currently working a a nested churn dash in a variety of your fabrics. the quilt is a gift for my mother. Wow, love the mini quilt. The colors are perfect and the quilting is over the top. Can’t wait to see Lakeside Gatherings, perfect colors. Thanks. Love your new fabrics and really wish I could visit your shop. As always, i really enjoy your blog posts! I loved seeing your first quilt….so beautiful! Thank you for the chance to win the beautiful fabric giveaway! Lisa I just love your designs! On my first quilt my teacher told me that if you use a tan or gold background the quilt looks older. I still love that look today. Keep on creating! Love your new Lakeside Gatherings line! Your mini quilt is adorable and the quilting is just fantastic. Love your first quilt and the fact that you hand quilted. Also love the new fabrics. LOVE your new line of fabric – the whites look terrific with the rest of the line. 🙂 Reminds me of the colors in your “first quilt”. Thank you. Thanks for sharing so we get to know you a little better. Love your fabric and designs. Wow, great job on your first quilt! I love the looks of your new fabric. Thanks for the giveaway. I love the pattern, especially the fact that you can get different sized quilts by using different pre-cuts. Thanks for sharing it. I really like your nine patch blocks and this fabric line. Love the fabric lines from Primitive Gatherings and looking forward to the new ones. I love the small quilt. The quilting is amazing! Primitive Gatherings is one of my Favorites! Love your little charm quilt. And, the primitive muslin?! Who knew? I obviously don’t get out much. Love your work and appreciate your inspiration to the quilting and stitching world. Really love what you did with the pattern using the mini charm packs, even if it was not your newest fabric collection. It really is very nice to see projects made using that size as they are such an affordable way to get the fabrics we love, and more of them. I see so many of the fabric collections that I really would love to buy, but gosh, I certainly can’t afford to buy fat quarter bundles of them all, and even the regular sized charm packs can add up quickly if buying a lot of the different collections. Your new line are colors I haven’t worked with. The gray is interesting. I love shopping your booth at the shows. OOOH, I would love to take a quilting class with you! I’ve never been able to take a class or go to a retreat and the closest quilt shop is 1 1/2 hrs from me. I just plug along here at home, learning from blogs like yours! It was fun to hear how you got started quilting! I love the mini quilt! I love, love, love your fabrics, and am just trying to decide what my next project with them will be! Jeep the creativity flowing. You are an inspiration and keep me motivated to finish so I can start my next PG project!! Wow – your first quilt is amazing and the hand quilting is beautiful! I love how you used all the mini charms in your little quilt, especially on the back. Your designs and fabrics are so inspiring! Thank you for your emails. Your first quilt reminds me of my first quilt, all hand done. Love the new fabrics can’t wait to use them. You are amazing, you give classes, make and design quilts, do quilt shows, run a store and have a family and love doing them all. I can’t wait to see your booth in Houston! Ane to hear more on the retreat house ! The little quilt is beautiful!!! So pretty. I usually have trouble with a lot of triangles, but this looks good. Love the lakeside gatherings. Modern with a touch of vintage. Love it. I love your first quilt! What a treasure! Love your new fabric line! Thank you for the chance! Love your new collection,they are always beautiful. I love your new Lakeside Gatherings line! The 9 patch quilt just reminds me of the quilt that was on the twin bed at my grandma’s house. I love the anchor quilt! Your new collection is wonderful. Thanks for the chance to win some! I love your quilt with the big anchor. Perfect for your house on the lake!! Oh, how I would love that bundle of fat eighths !! Am planning a quilt for my grandson and some of these would work so well in there. BUt…..with the white, blues, and yellows; I just might decide to make a quilt for myself out of them. Decisions, decisions. Your small quilt is lovely and I enjoyed reading your responses to Moda’s questions. The quilting on your design is absolutely gorgeous! I also really like the 1st and 3rd Lakeside Gatherings designs. Your colors are stunning. 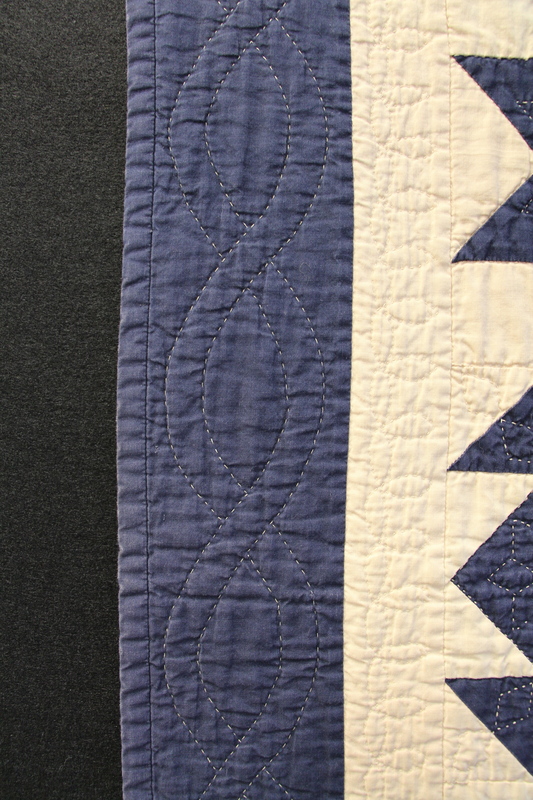 Your stitching on the blue and white quilt is amazing for a new quilter. I think you are a natural! Thank you for the opportunity to win such beautiful fabric. How on earth did you get your first lot of hand quilting so neat! I love the Lakeside Gatherings, so refreshing to see a more grown up masculine print collection. Love your little table topper made with the Homestead Gathering Charms! So cute! Thanks for a chance to win your new line! Love the new Lakehouse Gatherings fabric line! Absolutely love your quilt and fabrics! So very pretty…..thanks for the chance to win! I love your mini quilt – I think I may have to try making my own! Love your Lakeside Gathering fabric line. Would feel so blessed to win it! I particularly love the nine patch quilt in the plaids. Would love to make this quilt. I’ve pinned it for a future project. Thanks for the post and giveaway! Lisa, I love your fabrics, and it looks like the new line will be another hit! Went to my first and so far only quilt show in Long Beach and you and your husband were there, I was too new to quilting but I know what I like….LOVE your fabrics and wools! As I’ve said in on this tour I started out sewing clothes so I’m new to pre-cuts, but I have bought a couple of your fat quarters! I love your style and find myself drawn to your colors….I hope to visit your shop someday! Love your first quilt! You did an amazing job on it. I would love to win the bundle of your new fabric line! I am a Wisconsin girl living in Colorado. It would be fun to have something from your delightful Lakeside Gatherings line, direct from Menasha to the Mile High state. I love your first quilt. You did a great job! I especially like the hand quilting. I love the quilt with the star and anchor. I’m looking forward to seeing Lakeside Gatherings. I love your creativity, loved attending your class and have made many of your patterns! Lakeside Gatherings is beautiful! Lisa your bundle of fabrics is just wonderful! Thank you for the chance to win! Love your Christmas Gatherings designs. I have been using them for Christmas presents(especially love the snowmen! Lisa, you are amazing. You keep coming up with wonderful fabric lines and projects. I would love to win the fabric prize. I have used many of your fabrics and have a great collection of them. Thank you so much for the chance to win some of your great fabrics. I would love to do a workshop with you! I think lakeside is my new favorite line, but I sa y that with every release. Thanks for sharing all the new patterns, triangles!!! Hurrah!! And thanks for such a lovely giveaway too! I love everything you do – both cotton and wool, and have a stash to prove it. I have fat quarter bundles of all of your lines and love them all. They not only go well together but also with other patterns from other designers. Looking forward to visiting your booth tomorrow in Chattanooga. Love all of your fabric and one day I hope to visit your store. Love the new line and all your fabrics. Thank you for the chance to win. Ever since I was at your booth in Chicago several years ago, I have been in love with all your designs. I have loved wool forever, so was tickled when you started using them in projects. I buy all your towers of fabric, even if I haven’t used some of them yet, guess I need to get going on that!! Thank you for you sharing your talents with all of us. Wow, your first quilt looks gorgeous! The quilting on it is amazing, especially for your first! I like the nautical look to your new collection. It still can blend with so many other fabrics. Good job. Thank you for sharing your love of quilting with us. Quilt shop owners work so hard to be successful . I appreciate how busy you are and still take the time to share. Looking forward to seeing Lakeside Gatherings in my hands! Your fabric lines and colors are beautiful. Love seeing you at Paducah!!! Your booth is always one of my favorites! Thank you for all your hard work! Love the design and the fabric you chose!!!!! I love your first quilt! Wow that must have taken a long time to finish. I really like your new lines colour sand nautical theme. Thanks for the chance to win! I am always amazed at the vision you have for quilts and fabrics! I admire that! 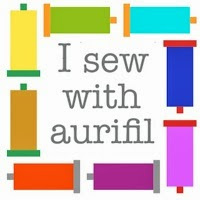 Thankyou providing inspiration in my quilting life! 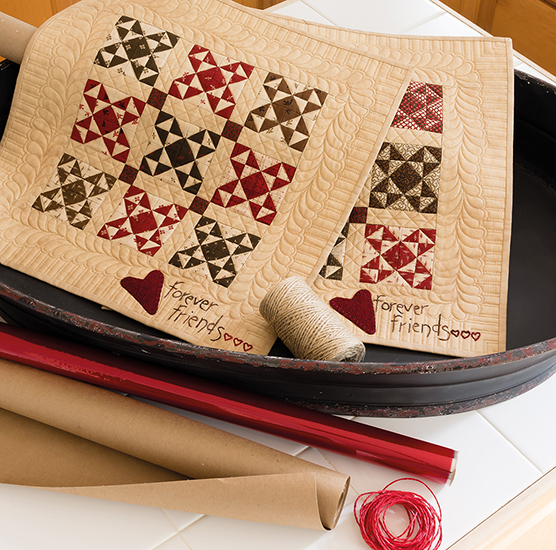 Love your new fabric line…wow, what great hand quilting on your first quilt. Love the way you’ve expanded the mini quilt! Thanks for sharing! One day I would love to visit your shop and retreat center…looking forward to hearing you speak at the Gwinnett Guild this month! Love your patterns and fabric lines, seeing your samples in person is always a treat at shows. I love all your fabrics but Lakeside looks to be a sure favorite. I have Homestead Gatherings and am planning on a quilt now with a layer cake I purchased -also a charm pack-thinking of doing the five and dime quilt. Lisa, I am in love with everything you create! You are so talented! Your Lakeside Gathering line is just beautiful. The colors are perfect. Your mini quilt is wonderful, and so is your new fabric line! Oh, how I would love to win! Absolutely LOVE your little quilt!! Gorgeous work, as always! I love your fabric and designs Lisa. The project quilt is adorable, and the quilting is beautiful! I love your fabrics and patterns. I just bought my newest kit from you at the Wisconsin expo! Thanks for the chance to win. This is such a fresh and happy line ; plaid too what’s not to like!!! Your post was so much fun! I truly feel giddy when your emails arrive. The table topper is just divine! I received my week 14 SBOW and I am so excited about the borders and setting the blocks. What an amazing project! Thanks for all you and your wonderful staff do!!! LOVE, LOVE LOVE YOUR SWEET MINI! I love your designs and enjoy making them. The new line is a change from my usual “primitive” choices. I like it and think it will be a good chance to expand my horizons. Love your block for Moda blog!! THANK YOU so much for the chance to win some of your wonderful Lakeside Gathering Fabric! It’s a winner…love the yellow and grey!! Very pretty! Amazing what each quilter is doing with this pattern. Fabric line, colors, quilting. I just printed the pattern from another person yesterday. Character, personality, skill sure makes a “new look” and all are beautiful. Love the new Lakeside Gatherings, thanks for sharing. This is the first time I’ve been on your Blog and have enjoyed looking at it. Love the Lakeside fabric collection. Thanks for a chance to win. I love your fabric, and I especially love your store. Keep up the good work! Love your fabrics and your patterns. You have such natural born talent. Looking forward to the new line when it comes out. Your fist quilt is so Great ! Love the fabrics and Thanks ! I love the colors in the new line! Love your new line! Thanks for the chance to win it! What a beautiful line! Love your first quilt! I love the pattern in the mini , so beautiful. And the feather quilting is awesome ! Thank you for the chance to win your new line. I live by the water on Long Island , NY and the nautical theme is super popular here ! I love your first quilt! I’m currently working on my first hand quilted quilt. It can be a little overwhelming, but your quilt and the lovely stitching are inspiring! Great fabrics that you used for this pattern. Thank you for a chance to win. Your first quilt is great. Thanks for the chance to win. I envy you your job ! And your enthusiasm is easy to see in your designs! Love the new fabric line. Never stop designing! I absolutely love the fabrics and colors. They look great together. I absolutely love the water so this nautical theme really speaks to me. These fabrics are lovely, and I especially like the quilt with the anchor on it! Love that little quilt! Your first quilt is amazing and look at that quilting! What a beautiful bundle of lakeside goodness! Thank you very much for the chance to win it. I love the new fabrics–I live on a lake, so you know I am going to have to have a big stack of FQ’s! Love that huge anchor! Thanks for the opportunity to win! The fabric is lovely! It would be so much fun to make something with it! Lisa, how do you do it??!! I don’t know how you keep it all straight, but I’m glad that you do. We all have a story of when we first discovered quilting — thank you for sharing yours. I’m looking forward to Lakeside Gatherings. Blue is my favorite color and I love plaids and stripes!! Your mini charm quilt has inspired me to try making a similar table topper. I’ll look through my stash of Primitive Gatherings fabrics. Thank you for the opportunity to win some fabric. Thank you for participating in the Moda Blog Hop. Looking forward to working with your Lakeside Gatherings line. It’s so fresh! I cannot wait for Lake side gatherings collection to be out. It is just so beautiful and so unlike anything else. Just discovered your shop when you were in Grand Rapids this year, it like opened up a whole new world to me. Thank you. Huh! Sometimes I can’t think past the nose on my face! Everyone is making the Moda Love quilt using layer cakes; it never occurred to me to use other precuts as well! I have a couple of minis here, waiting for the right project, and here you have demonstrated what I can do!!! I really like the back of your mini quilt, using the lights. I am looking forward to Lakeside Gatherings becoming available, it is beautiful. Enjoy reading your blog ~ and seeing the pics of the quilts you post. Love your first quilt, along with the hand quilting. I love this new line! And fat eighth bundles are my favorite pre-cut. Thanks for the chance to win. LOVE the anchor quilt!!! Thanks for all the inspiration on your blog and the chance to win. Your first quilt is beautiful. I am looking forward to Lakeside Gatherings arriving in quilt shops. Love your inspirational story of how you got into quilting. Have been a fan for along time! LOVE your new line of fabric and thank you for sharing your first quilt. I love this line. The greys are so pretty and that yellow is like the sun shining through on a cloudy day! I adore all of your fabric and wools. I would love to win the bundle of fat eights. I enjoyed reading your answers to the questions from Moda. I have always used my “tan” as my white fabric!!!! I just love the warm look you get with all of your designs. Can’t wait to get your new line and especially the pattern with the big anchor. Just so beautiful. I love your new line. I am loving whites also now. Would love to win…..
Lakeside Gatherings looks really goooooooooooood. I wished I had the first quilt I made but sadly I don’t. I am a fan and have been for many years. The blessings in your life that you get to do what you love and spread it all around. I love your first quilt…and you hand quilted it!! Wow! Would love to play with your new fabric. Thanks for the giveaway! My first quilt was about the same time as yours mine isn’t as classic looking. I used the colors of the day- mauve and mossy green! It still makes me smile though. Lisa I am just crushing on the new fabric line! I’m a New England girl who has spent the last 24 years in Atlanta, so nautical and navy is just like home for me! I am currently fondling my Snowman Gathering fabrics to decide on quilt pattern for them! My Seasonal Gatherings jelly rolls are waiting for me too! I love your fabric lines and want to say thank you for sharing your talents with us! 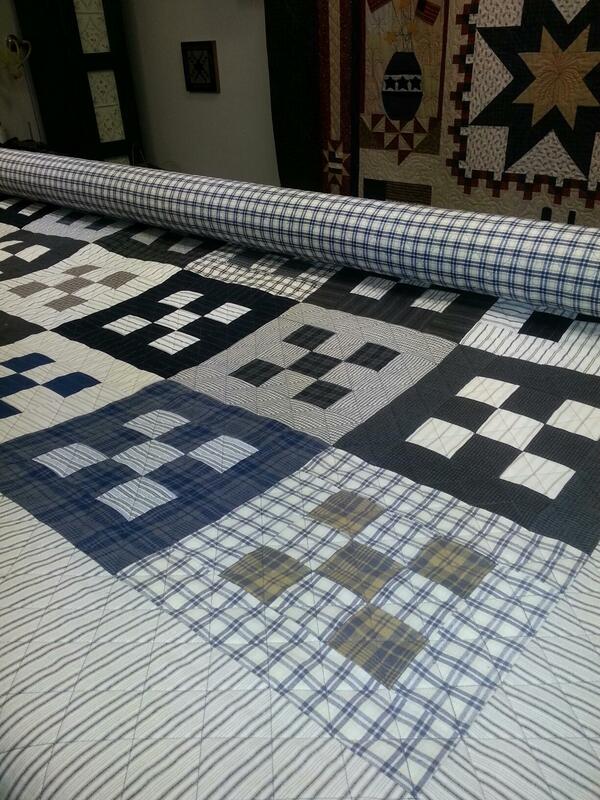 Love the quilts you are putting together with your new line! Would love a fat quarter pack to start one of my own! Your work is amazing. I am looking forward to Lakeside Gatherings. It looks fabulous! Lisa, I’ve decided you must never sleep with all the wonderful designs and quilts you get done… Do your hands work continuously ? Love your fabrics. I have only been quilting for a few years so I do know where my first quilt is. It resides at my daughter’s house and looks great there. Your fabric line is really great. All of the hand quilting on your first quilt is amazing. I love your Block and the fabric, Lakeside Gathering. Very striking block, indeed. Thank you for being a part of the Moda Love Blog Tour and the chance to become a Moda Winner of such an elegant fabric line. Love your fabrics and follow on Bloglovin. The difference the fabrics make in this pattern is amazing. So excited to see each designer’s take on it. Thanks for the giveaway. I love Lakeside Gatherings and win or not I will have to have some!!! LOVE the new Lakeside Gatherings line – sooo calm and serene looking! And your first quilt is amazing! Looks like you even have all of your points! Thanks for the chance for those beautiful fabrics! Love the gray and yellow combo. Love the anchor quilt and the sea themed fabrics, that would be fun to do. I am signed up for Lakeside Gatherings at the Fat Quartershop and look forward to it arriving. lovely mini! And the anchor quilt is just wonderful! I like that you made the mini charm version. It has been such fun seeing the same pattern in so many different sizes with different fabrics, I can’t wait to make my own version! Awesome stuff Lisa!! Love me some “Gatherings” fabric. Wish that I am the lucky person that wins. Love your response to “When I teach…” You are an great sharer of information and how to. Have attended a lecture with you and hope to get to a workshop in the near future. Oh Lisa your new line is my favorite! I live on the beach in California…of the possibilities!!! Thanks for sharing your passion. Love this fabric. Love love love your new line!! But then I love everything you do. Yours is the first booth I look for at a show! I also look forward to all your blog posts. I love your Lakeside Gatherings fabrics and the quilts you’re making from them. It’s hard to choose a favorite. I’ll guess I’ll just have to make more than one! Love your new Lakeside Gatherings collection. And your addition of the anchor on the Love quilt is wonderful. You are a true inspiration!! Keep your fabrics coming! Love them all! Your first quilt is wonderful……….you are obviously in the right place. Love the Lakeside Gatherings and the quilts being made from the fabrics. I will be looking for this in the stores when it comes out. Oh, Lakeside is gorgeous! I haven’t seen it before, but I’m definitely checking it out and adding your blog to my feed! Love how you used the mini charms… I bought some and had no idea how I was hoping to use them. Thanks. Love your mini quilt and your new fabric line! Your little quilt is stunning, so beautiful! ! ! I love the anchor on the star quilt, too. My DH is retired from the Navy, your quilt gives me ideas! Thank you for a chance to win some wonderful fabric, too. I think your first quilt turned out pretty darn good for a beginner, especially the quilting! I love your new collection, it looks fantastic. Happy Fall. I was immediately drawn to your Lakeside Gatherings collection – the prints and shades evoke fond memories. 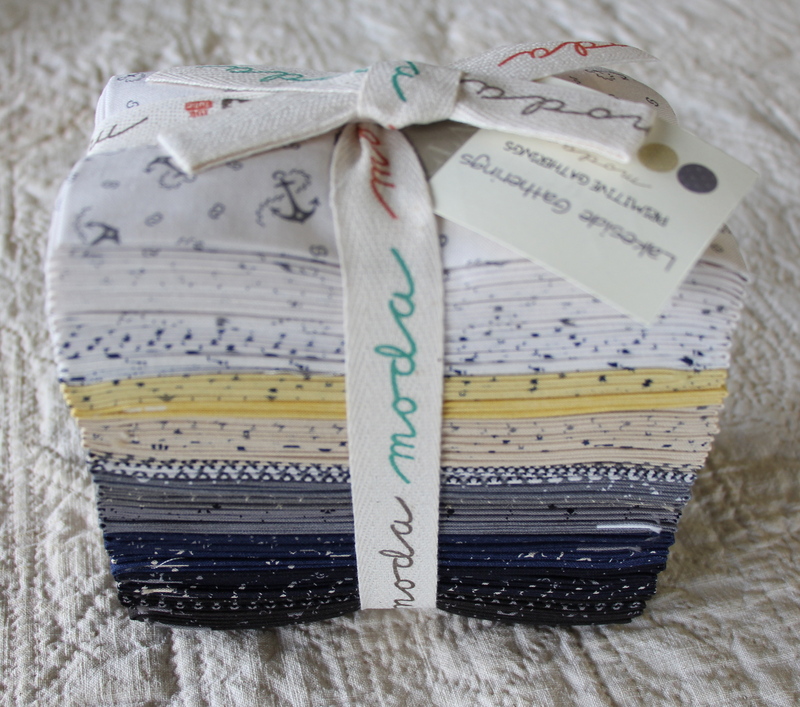 I grew up in Duluth, MN and maritime themed fabrics are on my “Most Wanted” list as I create from what I know. You do beautiful work and I was inspired with your Moda Love project to use some muslin with one of the items I plan to make. The small quilt is so pretty and the quilting is truly awesome. Thanks for the chance on your fabrics. Love your new line, and the quilt that looks like it was made of checked shirtings. Love your little quilt and I especially love your new line Lakeside Gatherings. Thanks for the chance to win some beautiful fabric!! I love the mini-charm “Love” quilt. Thanks for sharing a peek at the new designs. Lisa, I love the new fabric line! The last quilt would be great for my sons. Can’t wait til the fabric line is here. It’s hard to believe you only started quilting in 1996. The passion and love for designing is certainly in your blood. The blog tour has been fun. Lisa, I love all of your work. I am really enjoying your Block of the Week. I always look for your booth at quilt shows I go to. Always looking forward your new things. Your first quilt is rather beautiful! You did an amazing job just starting out. The star quilt is charming 🙂 and the Lakeside Gathering collection is full of gorgeous design. Thank you for the sweet offering! Hi Lisa, what does this mean? I can’t believe how good your first quilt turned out! You were destined for what you do. Thanks for the chance to win your new fabric line. Blessings! I love the anchor quilt! And I really love the colors in the new line. Thank you for the giveaway. I am amazed at your first quilt!! Gorgeous quilting too!! Thanks for sharing in the love hop!! Love your fabric lines! Thank you for all your creativity! Love the Moda mini charm quilt! Should work up fast. Thanks for sharing! Just discovered your blog and I like what I see. Your Lakeside fabric collection is really nice, love the color combo. That is such a pretty little quilt and the quilting is fantastic. Would love to win some new fabrics to make it. The mini charm quilt is wonderful, I love the quilting! Beautiful quilts! I love the nautical theme of your new fabric line. Thanks for the giveaway! Wow – your first quilt is impressive! The stitches are so uniform. It’s what I aspire to in hand quilting. Thanks for the chance to win! Love the Anchor quilt – and in a star! I just may have to make this for my husband, who retired from the Royal Navy after 37 years, and who always like quilts with star blocks. Love the colors in Lakeside! Love your patterns and fabric. Lakeside and the Anchor Quilt are so charming. Would love to sail away with them. Your first quilt is.. wow. That was very ambitious and turned out great. Loving the new line! I have been looking for a very gender neutral line and this just might be it. Beautiful new line! Love the colors. Thanks for the chance. Your 1st quilt is lovely. I’d love to win some of your new line of fabric – thanks for the chance! Your first quilt is terrific! Thanks for the giveaway! Love your first quilt and the charm version of the Moda Love block is beautiful. I love the new fabric and I would love to have a quilt made from it for our place at Roanoke Rapids Lake! Yes, I absolutely would love to win a bundle of your new line – the understated color pallet is so to my liking. I love the star quilt with the Anchor applique. It is awesome! LOVE your post!! The new line is great!! Love your little quilt too!! Always love to see what you’re working on….would love to come for a class!! Your first quilt is beautiful. You certainly chose a complicated pattern as your first one. My first few quilts all involved squares. It wasn’t until I joined a couple of quilt clubs that I even tried triangles. And that was because they were the homework projects. I am so glad I joined those clubs. I may never have had the courage to try half square triangles and all the other techniques. I have been quilting almost 2 years now and love it. I love your new line of fabric. Can’t wait…. I just love the Lakeside Gatherings fabric as well as that great quilt with the anchor! Love what you did with the Moda Love Shop Hop free pattern! I hadn’t started mine yet, so now I can go with your modifications! I love your very first quilt — can’t believe you weren’t daunted by the decision to hand-quilt your first project!! That giant star with the big ol’ anchor is so awesome!! I love it! I love everything Primitive Gatherings! A little Lakeside Gathering fat 8 th bundle would be so nice to make something for my little lakeside cottage! Loved learning more about you, Lisa! Your new line – Lakeside Gatherings is wonderful — such favorite colors of mine!!! The mini topper for the Blog Tour is too cute – that is on my to-do list!!!!! I love your new fabric line and would love to win the bundle. Wow! I love that border cable on the binding! Your booth is the first one I visit any time that you are vending at a quilt show. It is always inspiring and I always leave with supplies for a new project. I love your style and am looking forward to your new line. Lisa, You are so inspiring and I loved reading your story. Also enjoy when I get a chance to talk and visit with you at quilt shows. Keep designing as we all LOVE your fabrics and designs. I just love the quilt shown with the anchor on it. Beautiful! Thanks! The anchor on the quilt complements Lakeside Gatherings. Perfect for a chair on the patio by the lake. Thank you for the giveaway! Love the feather quilting on that little quilt. I imagine that over my fireplace as my Christmas wreath. I like your miniature version of the moda blog block. Sure would love to win. Oh the pretties I can make with this fabric! I love your first quilt! I especially admire those who hand quilt. Enjoyed reading about your first “real” quilt. I loved the hand quilting on it. So pretty. Thank you for the give away. Your first quilt is beautiful. Isn’t it wonderful to look back and see where you started? Thanks so much for the chance to win some of that scrumptious fabric bundle. I love star quilts! They don’t always love me, especially those darn flying geese, but I haven’t given up yet. Wow, your mini is gorgeous. The quilt is superb. All of your quilts are inspiring. I am really enjoying this Moda tour. Your mini is so cute and I love the feathers. Thanks for showing your early work. Your skills have greatly increased. Thank you for doing the Moda tour and the give away. Beautiful quilting! Thank you for sharing your talents! I love the LakesideFabric, as I do all your fabric! Thanks for the opportunity!! I love the color combination of gray and yellow together. Anticipating the arrival in December for the fabric and possible kits Lisa. Great look. Love the mini! Thanks so much for the chance to win some of your Lakeside Gathering. Oh gosh, I love those colors and patterns…they’re so soothing, they sing to me! Thanks for the chance to win. I started quilting in 2005 but haven’t sewn is quite some time (due to lifes ups and downs) but you’ve inspired me to go out and purchase the material and start sewing again – starting with something small. I think I will make this for a holiday gift! Kisa, I love all you do. These fabrics and patterns are wonderful. You are my inspiration! I will have to make a stop in to your store again-its been too long! Your version of the pattern is perfect for my home. Love your Lakeside fabrics-December is too long to wait! Your blue and white quilt is absolutely beautiful. It looks like something from the American Folk Art Museum. And look what it led to! Thank you. Just beautiful…anxious to make one for myself. Love your designs and resulting quilts! I always look for your booth at the shows. Love the new Lakehouse design. I like the white…kind of a nice departure from the other lines. Can’t wait to see it in the stores! Wow your new line is beautiful!! Can’t wait for it to come out. Lakeside Gatherings is lovely. Another great collection! Your first quilt is amazing! Hand quilting is my favorite and yet I never make time for it! You have inspired me to make more time for handquilting, thanks. I love the 9 patch! I love reading about your first quilt….it’s beautiful! I love your quilt small. I came make more quilts if they are small. As always, the quilting is outstanding. Very inspiring! I’m in love with the plaid quilt! I would love to win this fabric!! Your first quilt was so much more adventurous than mine! My first quilt was a triple rail and I machine quilted it. I love your Lakeside Gatherings fabric. The colors are perfect. I can already think of my next project using this fabric. Thank you for a chance to win. The quilting was beautiful! I love your new fabric, and the quilt that I made with Snowmen Gathering!! I love your mini Moda Love quilt! It would look stunning in Lakehouse fabrics. Thanks for the chance to win! I would be so excited to win your bundle. I like all the quilts in this post – they would all work brilliantly in my bedroom! Oh, I just love that little quilt you made! It may very well be one of my favorites. I love small projects. They really do leave us working gals with a fine sense of accomplishment! Really enjoyed reading about your love of the process of quilting and teaching others. I have yet to make something using black and white prints. Your line looks so fun. I would like to play with it. Thank you for sharing your passion. I like your idea for a Moda designers collaboration line. I hope Moda does that! Your mini quilt is adorable! I’m still in love with Homestead Gatherings, but i love your new line also; a really different look. Sure would be fun to win! Love the mini quilt you made for the blog hop. I am not normally a fan of white in quilts either, but your Lakeside Gathering line could change my mind!! I always enjoy reading and seeing what you are designing next. Your designs are the best. Thanks so much. I love how you used the light fabrics on the back of your mini quilt. And your quilting is beautiful! I would love to include some of those prints from Lakeside into a quilt I’m working on for my front porch. I’m totally in love with the anchor on the star quilt– AMAZING. I might have been tempted to make that for my porch if I wasn’t already partway into the one I planned. Perhaps I’ll have 2 quilts for the porch… hmmm… Thanks for the chance to win! Love your fabric, design and quilting. Thank you for all your wonderful inspiration. What a great line of fabrics. 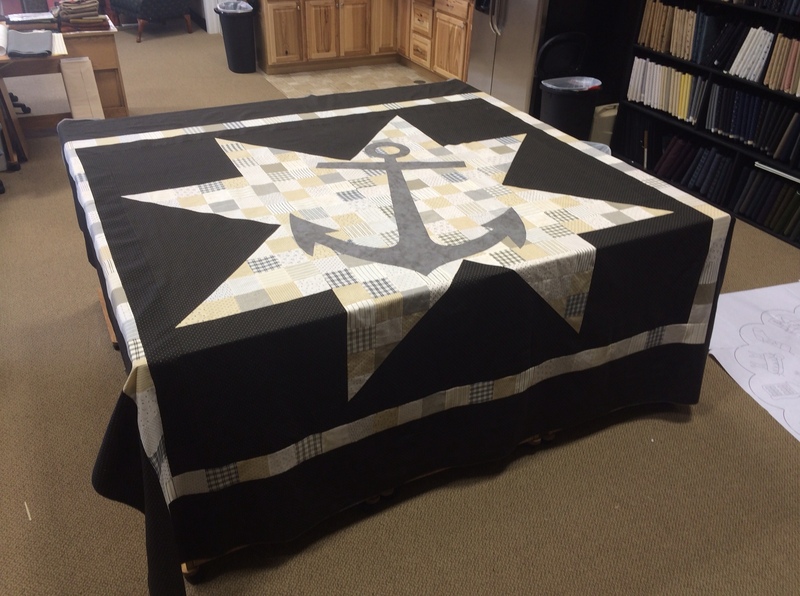 Love the star/anchor quilt! 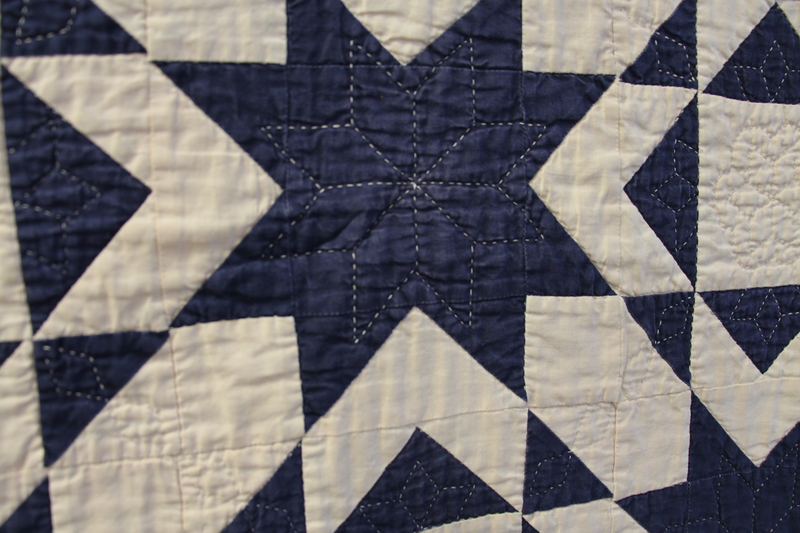 Your blue and white star quilt is beautiful. “Primitive Gatherings”. I hope you never lose that enthusiasm & love you have. Wonderful fabrics, I love blue and cream quilts, hanks for sharing. 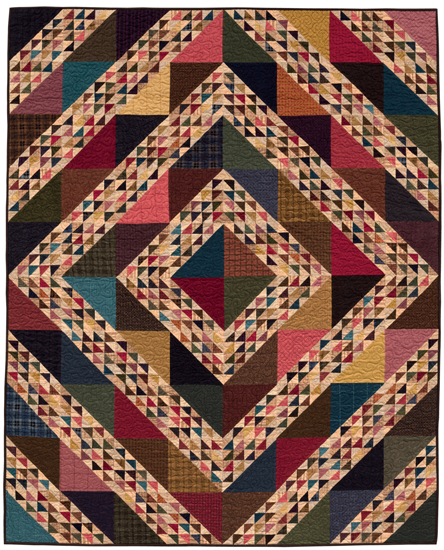 Love the colors of the Homestead Gatherings little quilt! The plaids of Lakeside will be fun to work with – thanks for your generous sharing. Looking forward to the release of Lakeside Gatherings. Beautiful as always. I love the colours in your new line! I love the new line of fabric!! You have always been amazing–look at that hand quilting on your first quilt. You continue to inspire me. Love the Lakeside fabric line. Hope I win. I am so impressed with your first quilt – both the quilt top and the quilting! My first isn’t half that good. Love the yellow with the gray! That anchor is awesome! 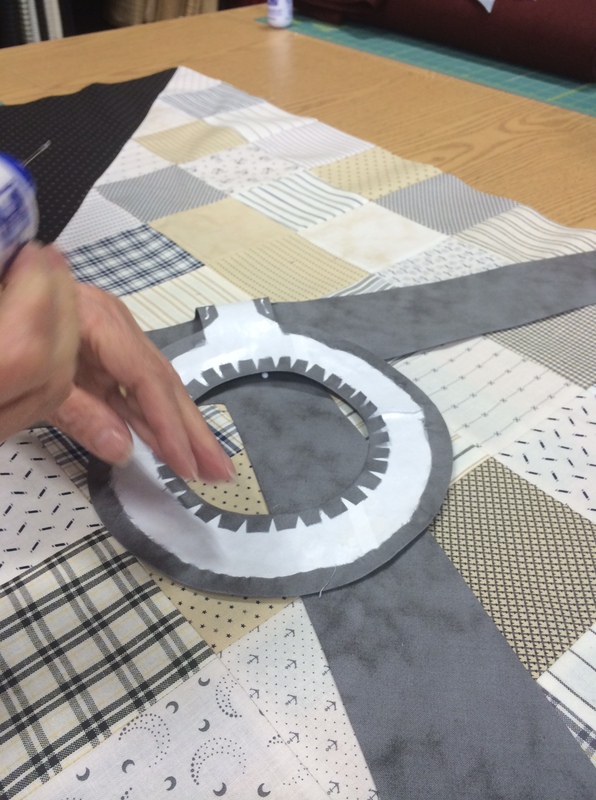 That hand quilting inspires me; it’s wonderful to see someone else’s process — and progress. After making 57 quilts it’s now time for me to HAND QUILT one! Your first quilt is stunning, as your new line ! Love Primitive Gatherings fabrics and always try to get every fabric in the line for my stash. I would love to win. Coming to visit your shop in a couple of weeks with 4 friends. You are on my bucket list to meet and take a class from. Thanks for sharing your lovely quilts & thanks for the chance to win. I love this line! Blu never used to be my color, but lately I am loving it, especially with all whites. Your quilting is lovely! I would love to win a stack of your Lakeside and make a pretty ninepatch quilt. You say that you are beginning to use white and I am just now starting to like the color gray. I especially like it with yellow. Thanks for the chance to win! This Lakeside Gatherings is a Must for me! I really like that quilt you have on the quilting frame, the squares. It is beautiful!! I haven’t been into whites either but this line has me drooling! Thank you for the chance to win. So far you are my favorite Love Blog Hop! Lisa, your talents always amaze me. I am a quilter wanna-be! Love, love, love this fabric!!!! Blue is my favorite color! I spent many years of my childhood at my grandparents home on a lake fishing, swimming, boating and just the love of water!!!! Great memories! I really just love your hand quilting on your “first” quilt… I have made about 4-6 quilts in the last four yrs.,(I am a some what informed beginner) I love the colors of Lakeside Gatherings. Thank you for sharing your blog and quilt. Ohhh — beautiful colors! In this day of modern fabric designs, it is refreshing to see “old-fashioned” colors and simple designs that are naturally pleasing to the eye. Thank you for the inspiration! I think your first quilt is beautiful , my first was a red white and blue trip around the world from a good housekeeping magazine made in 1977?? I was still in high school..Love the new fabrics, can’t wait to add some to my stash! Love all your tiny stuff. Thanks for the giveaway! It would be so fun to come visit your shop. I’ll settle for your blog and new fabric line for now. I, too have been trying to use some colors outside of my comfort zone & it is harder to use the light, bright colors, but I am finding myself liking them. I would be thrilled to win your fabrics, as everything you do is a design that I really like. I discovered your patterns recently through our local quilt shop. I’m so delighted you have felted wool charm packs! It can be so hard to find felted wool in patterns rather than solids. I’m making six of your snowball runners for Christmas gifts this year, and I’m very excited about it! Being a hand quilter, it was fun seeing your first quilt. It’s lovely! It would be fun to play with a bundle of fat eighths! Have never done that. Mostly I make smaller things. Quilted purses, book covers and tech cozies. What a fun fabric line — my nephew is currently deployed with the Navy so I am really interested in nautical things right now. This is lovely. I would never have guessed that your quilt was a “first quilt! !” I think your quilting looks great. Like the pop of color (yellow) in your new line. I am so excited about this new fabric ! Ilive on a lake and have so many plans for this new line! Thanks for this chance to win this new line. This has been such a fun blog hop. Thanks for the generous giveaway! Cant wait fir your new fabric line, have a few ideas swirling around on what to make. Love the Anchor! HI, love your new fabric line! Thanks for sharing on your great Blog+a Giveaway too! Those a beautiful quilts. The stitching on your first quilt is really lovely too. We have a cabin on a lake in northern MN, I’d love to have a quilt like yours. I love your mini quilt, the quilting is awesome. Your small Moda Love quilt is inspiring. 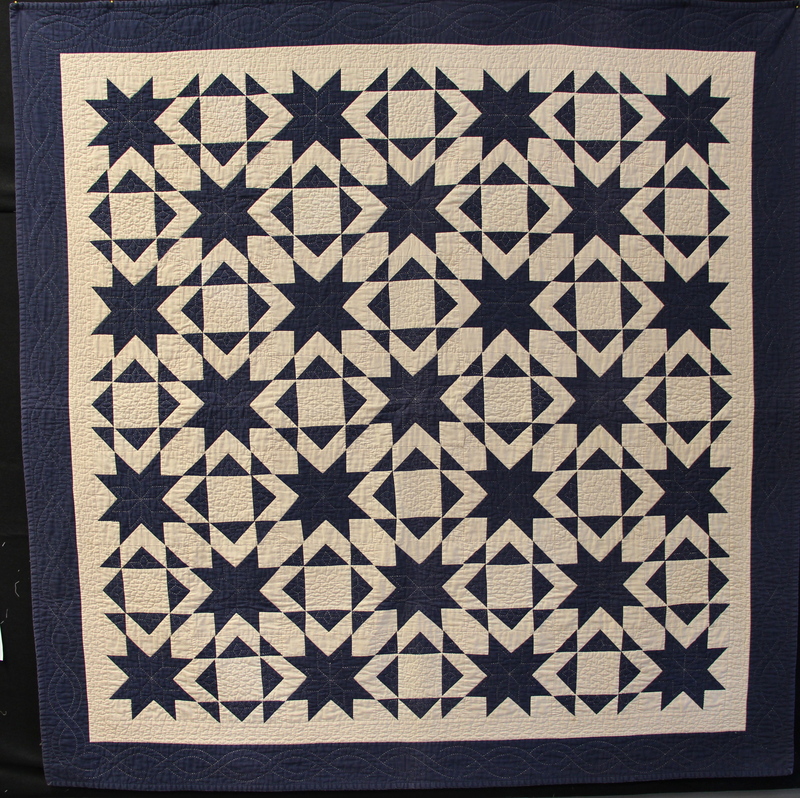 I really enjoy looking at the quilts on your blog., and particularly like the star with anchor. Sooooooo glad you became a quilter…love all of your designs and fabrics. Would be thrilled to win. Thank you for the giveaway. Thanks for the opportunity! Happy quilting. OH my goodness, I am in love with LAKESIDE GATHERINGS………I am a huge blue fan….and usually not a yellow fan……..but that buttery soft yellow is perfect, and I have been converted!!! Since you have shared photos of your lakeside house, I can envision you enjoying your quilts up there. My grandma used to go every summer to a church event in Lakeside…..so just the name sends me down memory lane filled with sweet thoughts of my grandma…….and yes she was a big quilter. In fact the quilt I inherited from her is a blue and white treasure. I would be overjoyed to win that lovely bundle of beauty, and I will be hoping for that, but right now I need to go make that little quilt you showed with the mini charms from HOMESTEAD GATHERINGS. I just happen to have 2 mini charm packs tucked away….but not for long! Only wish I had Linda Hrcka to quilt mine too. You two are simply a dream team! Thanks for the chance Lisa! Lisa, I so much enjoy your design work and fabric lines. I look forward to your next collection. I have been saving fabrics having to do with water to make a quilt for my husband. This is perfect. Would love to win the lakeside gatherings fabric! Loved your first quilt, sure doesn’t look like a first quilt–it’s really good! So fun to read about your “beginnings”. I really like your first quilt! Love, love, love this fabric line. Can hardly wait until it’s available. Would be an honor to win a pack now and have something completed before it comes out in stores. Fingers crossed. I love the new Lakeside Gatherings line . . . the yellow against the navy adds so much! I really love your fabric and the little quilt is darling. Primitive Gatherings is definitely one of my favs! Oh your mini quilt is just fabulous… and the quilting is terrific. Did you do it yourself? Nice job!! Lovely quilts! Hand quilting is so great. The new fabric is wonderful! Beautiful quilts! Can’t wait for the new line – the colors are so wonderful! Thank God for Primitive Gatherings – always keeping the creative spirit flowing! I love your design using the mini charms. I am excited to use the pattern! I love being full of good intentions and the hope to accomplishment them by quilting. I saw your prize winning quilt at the recent quilt show in Grand Rapids, MI. It is beautiful! (Even better in person that the photos online). Lisa thanx so very much for sharing your love of quilting with us! I “love” your style, warmth of colour and designs! Love love love your new fabric line! I can’t wait for it to arrive. What a really cute mini quilt!!! Lakeside Gatherings will be a huge hit, I’m sure – would love to have it right now along with that pattern. I’d make it for my niece. Thank you for the opportunity to win some ahead of time. OH man I sure do love that Lake House fabric. Your first quilt looked so professional. I’m having so much fun “meeting” all of you fabulous designers on this Blog hop. so much beautiful fabric, and years of knowledge. Thank you so much for your generosity in giving this fabric away. It’s so bold and beautiful, and your quilt is also beautiful! Love all of your fabric. Hope to take a class from you in the future. Oh, yellow and grey is my favorite color combination right now…and the blue with it is wonderful. Nice to meet you, Lisa. I’ve seen Peimitive Gatherings and fabric but never had the chance to get to know you before. glad you stopped by…hope you win! I love your quilt patterns and material! I love the prints in your fabric line! I love this little quilt and the fabric is gorgeous!!!!! I do not know how you create such lovely things when you never sleep!!!!!!! Love your pieces, working on your sunflower gatherings now. Love your first quit! My first quilt adventure was making a double wedding ring quilt – hand cut with cardboard shapes, quilted by hand all of it – Queen sized! Still have it! Love your fabric and I also love anything Moda! Am excited to see your new line. I really like nautical themes and beachy stuff. Like the blue & whites they look so fresh. Thanks for a chance! I really NEED this fabric bundle ! Oh. My. Gosh! That anchor quilt could not be any cooler! I need to make that! Thanks for designing such great fabric! your mini version is so sweet. thanks for the giveaway. Thanks for the giveaway. Love that Lakeside Gatherings fabric. You do beautiful work. Your color combinations are amazing. Thank you. I love the colors in your new collection! I am so inspired by the quilt made from plaids, too. I have to make that one! Thanks. So glad I found your blog, it’s great!! I love the Lakeside Gatherings fabric, so pretty! I love your mini charm quilt! I’m having a great time on this blog hop! What a great stack of fabric. Would love to win and work with it. Nacy P.
Love your new Lakehouse line. Thanks for the chance to win! Another fantastic line. Thanks for sharing. I love your mini quilt – so adorable! That plaid and nine patch quilt is really a great pattern. Loving the blog hop! Everyone’s quilts are so pretty in their own way! I love your Lakeside Gatherings fabric line! I am inspired by your hand quilting. I am just trying to learn how to do it, and I am amazed what you did on your first quilt! I will just keep trying!! Your new line reminds me of a relaxing day at a cottage, so soft and blissful. I always look forward to your new lines. Your first quilt is a thing of beauty because it was made with love. I love your patterns and fabrics. I really enjoyed your booth in Grand Rapids last month. It was the first booth I went to when I got into the quilt show. Thanks for the giveaway. I love your patterns and fabric. Wish I had more time to make it all! Love your new fabric line! Thanks for the chance to win some beautiful fabric! You never disappoint— your designs are wonderful. You are a very generous with your time and talent. Thank you! What beautiful work and lovely fabric! Lovely!! I am love this line of fabric – Thank you!! I love that anchor quilt!!! It is absolutely stunning!!! I can’t imagine hand quilting a first quilt let alone one now, I admire that you jumped in like that to start. Your new fabric line is wonderful, would make a beautiful “guy” quilt, it can be hard to find good looking fabrics for those quilts for the men in my life, I will be looking for this. Amazing work! I love the fabric. I love your little version of the Moda quilt! Your new fabric line is beautiful! Love your new line of fabric. And…once again, your version of the quilt is my favorite. You just keep outdoing yourself. Love your mini version of the Moda quilt. Your quilting is outstanding and makes the quilt really stand out. Love your new fabric line, Lakeside Gatherings but then again I have yet to find anything that I don’t Love at Primitive Gatherings. I love both your first quilt and the miniature quilt (my passion)! Beautiful mini quilt! I enjoyed getting to know you better. Your sample projects are great, I love the colors of your new line. You are such an inspiration. Everything Primitive Gatherings is my style. Would love to be a winner. Thanks Lisa for all the eye candy. Just not enough time to make all the things swimming in my head. Looking forward to seeing you in Des Moines in October at the. AQS show so I can take a some Primitive Gatherings home with me. I always enjoy seeing your work. The fabric line is great. Thanks for a chance. I always enjoy your blog and the sample quilts are fresh and different. The new fabrics are wonderful – were they in honor of your lakehouse? Thanks for the opportunity to win some … crossed fingers! Love your new fabrics – perfect for the lakehouse. Thanks for the chance to win. Absolutely love your shop! I was fortunate to meet you this past June when my husband I and were traveling from a family reunion in Minnesota, across northern Wisconsin and the UP of Michigan, back down to Door County and across to Menasha. I love FQ towers, too!! Absolutely LOVE your hand-quilted quilt! I love the way your mini charms quilt turned out! Mini charms are fun to work with!! Beautiful quilt! I live by the sea, the anchor quilt would look so good on my wall! Love your fabrics! I am in love with your mini charm quilt. The colors are beautiful. Thanks for the giveaway opportunity. Your fabrics are so warm and welcoming! I have used many in my quilts. I’m looking forward to adding your new line to my “stash”. Enjoyed seeing you in Grand Rapids. I love the colors in the giveaway! The quilting on your project is beautiful! Your new stuff is great! It will never beat out your usual influence of primitive looking fabrics in my opinion but wow! What a great second! Wonderful ability to modern and totally chic! Love it! Love your mini and your new fabric line. Ohhhh, your quilting is GORGEOUS! I struggle to sew a straight line, so seeing your beautiful work is definitely impressive! Love your Quilts!! Your first one is Amazing!! Handstitchimg is Beautiful!! Loooove the Fabric Bundle too!!! Mmmmmmmm…. Love your fabrics and would really happy if I were to win! Love the colors in your new line of fabric-thanks for the chance to win !!! I enjoyed reading your blog- just like visitng with you in person. Your passion shows in all you do, express and create. I love coming to Menasha (as you know) and anyone who hasn’t you’re totally missing out. If you think the website or shows are amazing -the shop will blow you away. Thanks Lisa for all you do and who you and your team are. I love all your quilts and love the look of hand quilting. I don’t think I have the patience to try hand quilting. Love the anchor quilt. Spent quite a bit of time (and a good deal of my mad money) at your booth in Grand Rapids. I will never tire of your inspiration. Love to see your designs in Primitive Quilts as well as here. Thank You! Your new fabric line is gorgeous. Can’t wait to get my hands on some of it. Absolutely ❤ anything PG! have two charm packs of every line you've done so far, and those are in my just to have stack. That doesn't include the yardage I have bought that I use. I know I've asked before, but PLEASE, convince Moda to carry the Primitive Muslin in Tallow as a constant in their offerings. I love that and use it all the time. I'm getting low and starting to panic! Love Lakehouse Gatherings!! Looks like the perfect line for a Cottage on the Lake Quilt!! Would love to give it a whirl!! Thanks for sharing with us Lisa!! Love your idea for the mini wall hanging. the quilting is lovely . Eileen h.
Can’t wait for your Lakeside Gatherings. Our family is fanatical about the water. And my husband’s passion is waterskiing, so that obsession gets me the freedom to do alot of shopping for quilt accessories. And, Lisa, I think you should do your Star first quilt using your Lakeside Gatherings fabrics. It would be phenomenal ! Sorry, mistyped my email address, in previous comment. Love your Quilts! & the Fabric in Give-a-way are Gorgeous! Love them!!! Everything you do is so pretty! Thanks for sharing the photos with us. I like the new lakeside line. Thanks for the chance to win! This is the first time I’ve been on your blog. It is simply beautiful! Love star quilts! My first quilts were with my mother in law and made of double knit and then we tied them . The new line is truly wonderful. The quilt came out GREAT. You have so much skill for such a young person. Keep creating. I’m impressed. Love the new line, I think it would be great here in northern Michigan especially since we have 3 lakes surrounding our city…. Enjoyed going to the booth at Portland OR Quilt, Stitch and Knit. Would love to win bundle. Thanks for sharing the quilts. Very impressive! Love the colors in the new line!!!! Can’t wait to visit your booth again at Road. It’s my favorite! 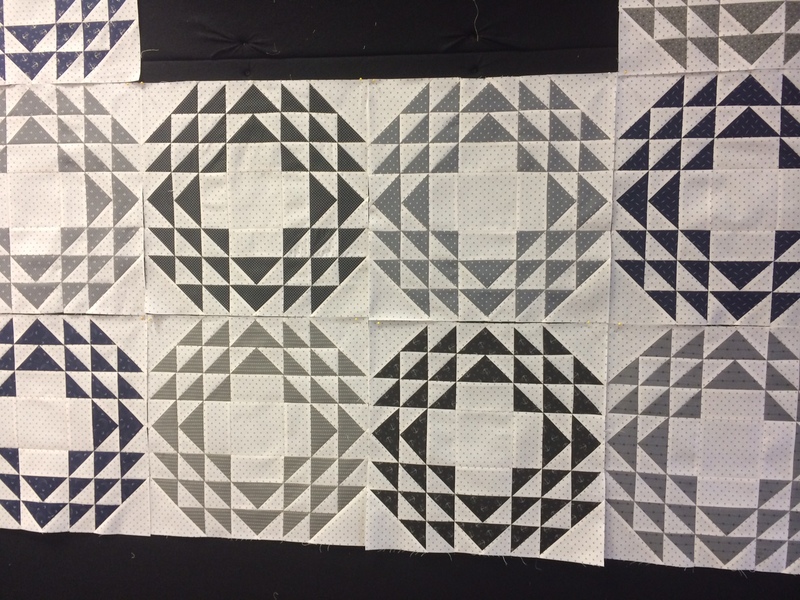 Your first quilt was wonderful – and really gorgeous hand quilting !!! Love your new fabric line. Your first quilt is great. I love your fabric; my favorite colors. Your quilts are outstanding! Lakeside Gatherings fabric range looks new and fresh looking forward to seeing the range in oz. Lisa, I am such a huge fan I feel like I know you anyway but reading your answers to the Moda questions was a lot of fun. I love your new Lakeside Gatherings and can’t wait for it to come out in December. Yes you right, 6 needles in a pack certainly aren’t enough! The new packing looks great for what I call “butter needles”. They slide right thru wool layer after layer. To be 100% honest I dream of you making them a touch longer for your long fingered fans. Please oh please. Your hand quilted scrap quilt is beautiful and I have a pile of strips just right for the task. Love your enthusiasm! I like the collection of neutral fabrics you’ve selected for your new line. I love working with muted tones and focusing on the design of a quilt. I’d love to win your giveaway. The designs and quilting you do are beautiful. I think Lakeside Gatherings is a beautiful collection. Ooh, Lakeside Gatherings is calling my name, I love it! Thanks so much for the chance. Love your fabrics. Thank you for the chance to win. I love the “Primitive Gatherings” look, it’s so warm and cozy. I must not be alone because your booth is always the most popular at quilt shows! 1) Lisa, your first quilt is amazing! 2) I like prim as well but I’m attracted to some of the modern quilts (in a prim sort of way) 3) will you be teaching any wool online classes? Too far for me to get to WI. Lisa, My husband and I stopped in your shop this summer. We are from California. I love your shop and wish we had a shop like yours nearby. Thanks for continuing to create new fabric lines. I love each and everyone of them! You are right, 6 needles in a pack is not enough! The new packaging looks great and can’t wait to see in person. I call your needles, “butter” needles since they go thru layer after layer of fabric. To be honest, ever consider making some a touch longer for your long fingered fans? So enjoyed your blog. How can quilting make me so happy? Love that pop of yellow in your Boathouse Gatherings line. Keep up the good work and taking me to my Happy Place. 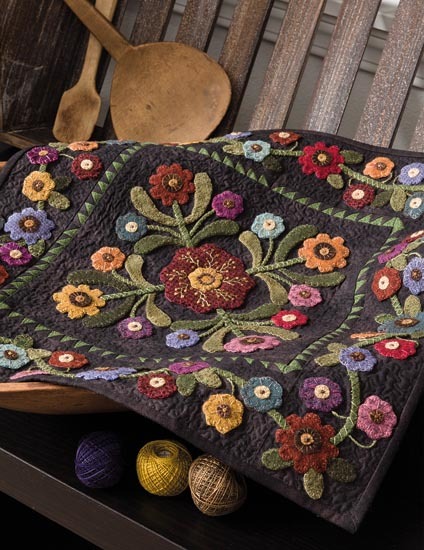 Lakeside Gatherings is lovely and love the quilts you are making. Absolutely love your mini quilt – love the colors and the quilting is amazing! Lakeside would be such a treat – thank you for the opportunity. LOVE your creations Lisa!! I love all the warm and primitive looking styles and they fit so nicely in my home. I would love to win your fat-eight bundle!! Funny how you say your favorite color is Moda! So true! Took me awhile to find the comment box, but eventually I did find it. Your hand quilting is beautiful, the new line of fabric is cute too. Enjoy your blog , your fabric [just used some on a With Thy Needle and Thread cross stitch pattern], your patterns, and postings in PQ&P magazine. It is difficult trying to find a fabric to finish little projects, so I now just use PG fabric which is the perfect scale[design]. I, too, love the fq tower best……..but, sometimes it is too much for a small project and that’s where the other precuts are lovely!. Your colors are wonderful!! My daughter needs a new quilt for her bed headboard and the new line would fit nicely since she LOVES blacks and whites. Lisa, I love your designs and have bought several of your kits. I have wanted to visit your shop for several years. Maybe next year I will make it. Looking forward to the new fabric line coming out! The samples look wonderful! Looking forward to your new fabric line coming out! The samples look wonderful! Love your fabrics, love your designs and love what you do! I found a quilting home at your virtual shop! Maybe some day I can visit the real thing! I love your Anchor quilt I need to make one for us! We were both in the US Navy! Your new fabrics look wonderful to do it! Would it be wrong to just love your bundle of fabric for a long time all tied together without using it, probably but somethings need to be appreciated just for it’s beauty for awhile before one makes that first initial cut! Ok…if I win I plan to gift to a friend who has gone out of her way to do so much for me, even though I want to use it myself! They say you can’t win the lottery unless you buy a ticket….here goes my entry! I love your quilts. The designs are very pretty. Love your version of the quilt pattern, I thibnk it’s my favorite. I also love your wool patterns and kits. Love the giant version and the mini. Pick me, I promise I’d make good use of the fabric! Love your quilts — and your quilting is amazing. I love Primitive Gatherings ………was introduced by a good friend. Keep them coming! Love your first quilt and I really enjoyed learning more about you. Your quilting is absolutely gorgeous! You are so very talented. Lakeside Gatherings looks so delicious! I can’t wait to get my hands on some. Beautiful quilts! I would love to make a quilt for my mom using the new line! A most impressive first quilt! Thanks for the chance! I love the moda quilt done with the mini charms and the large border. The quilting is magnificent. Those fabrics are fantastic…never thought I’d be attracted to grays and yellow but the combination is outstanding! Love your star quilt, the first one, it is really impressive for the first quilt! Your collection would make such a beautiful summer quilt! I LOVE the Lakeside fabric!! I live on a lake, and use lots of lake inspired themes in my quilts! Thanks for this opportunity! Beautiful fabrics! Thanks for the giveaway and for sharing your talent with all of us. Loving your new fabric line. thanks for the chance to win some! Lakeside Gathering is gorgeous! I love the colors! Thank you! The quilting patterns on your mini charm quilt are so pretty! I aspire to one day quilt in anything other than a straight line! Nice prize – thanks for the chance to win! Your first quilt puts my first to shame. Love the grays. Love the new fabric line. Would love to win. Great block. For your first quilt I think you did an amazing job. I tied thousands of whole cloth quilts but wouldn’t piece for anything. It was only 3 years ago that I finally tried stars! The minis are darling. Thanks. Your first quilt is amazing, I’m a big fan of blue and white quilts. Love the Lakeside gatherings line. Your first quilt is so well done for a “first” and the hand quilting is amazing. Thank you for the great giveaway. 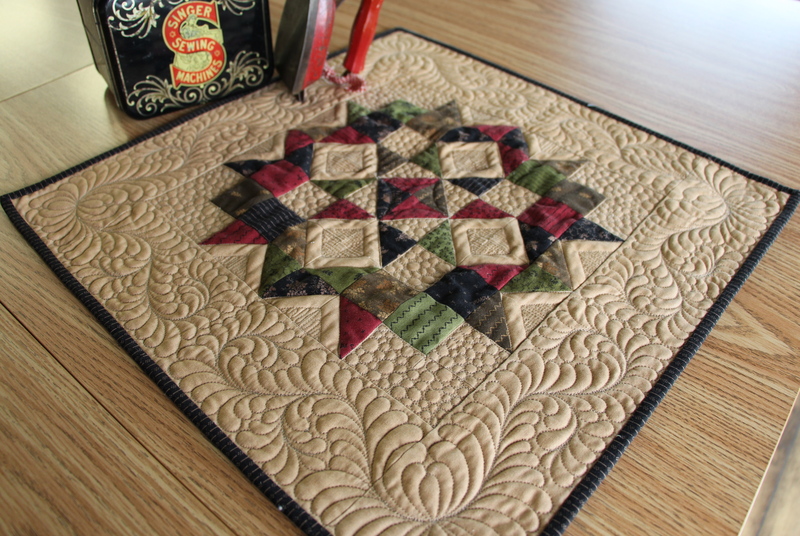 Your first quilt is fantastic and it’s hand quilted….love it! Your new line is wonderful. I love your mini block. Your anchor quilt is fabulous. Hi Lisa! I love your new fabric line! I love the pre-cut fat-quarter towers too! Gives me more options when picking out fabric first, than looking for a great pattern. I really loved your first quilt . . . mine was a Quilt In A Day pattern, more that 30 years ago. Wow, time does fly when you’re having fun. Appreciate all your hard work & devotion to bring us great fabric, patterns, threads & needles. I absolutely love your project and the quilting looks amazing . Thanks so much for the chance . Wow you have shared some beautiful quilts with us, thank you. Love the hand quilting on your first quilt! I just LOVE “Lakeside Gatherings” Thx so much for your inspiration. What an impressive first quilt! I love the punch of color in your new line, Lakeside Gatherings. I also enjoy all of your patterns. Can’t wait until Lakeside Gatherings is available in stores. Love the colors in the Lakeside Gatherings. I am a fan! I love your fabric lines. Can’t wait for Lakeside Gatherings! Thanks for the giveaway. I really need to make a star quilt. My husband wants a red, white and blue quilt and I’m thinking stars is the way to go. Lisa, I love all your patterns and the new fabric is just beautiful. Thanks for sharing! Oh my gosh this hop is so much fun. I would love to have your giveaway gift at my house to play with. It is lovely. Thanks for all the fun. I love your first quilt. Hard to believe it was your first real quilt. Your hand stitching is beautiful. The Lakeside Gathering is a lovely collection! I love your Lakeside fabric!! It is gorgeous. I go to a lake every summer for vacation up in Michigan. Your small quiits are so beautiful and creative. The quilting really makes the quilts! Your new fabric is really pretty ~ I can see a manly quilt made from it! Wow! Who could resist to have these fabrics?? Your Lakeside fabric looks lovely. I am already thinking of what pattern to use it with. Thanks! Oh my gosh, Lakeside Gatherings is my favorite of all your lines… beautiful! And your first quilt – it’s amazing! I think you were truly born to quilt! Your new fabric line looks great, I love the scrappy star quilt with the appliqué anchor. I loved the anchor appliqued quilt. Wow–hand quilting your first quilt. I am impressed. Thanks for sharing the photos and stories. I love the look of your Lakeside fabrics. Just gorgeous. Beautiful Fabric!! Thanks for the chance to win!! I just love your fabric and designs. Thank you for a chance to win. Lisa, I love all your designs! I wish I had just a smidgen of your talent! You have such beautiful taste in fabric design!!! I really enjoy the colors! That is a beautiful group of fabrics! Thanks for sharing your talent. I love the primative reds and naturals together — someday I will use that combo for my “red/white” quilt. Thanks for participating this fun hop! Love the Lakeside fabrics. Hope to visit your shop next month. A first time for everything! I will definitely look you up the next time I’m in your area – I’m near Madison. I’d love to win the Lakeside Gatherings pack from Moda. I love the name of the Primitive Muslin you used, Paper Bag. That’s a great name! That hand quilted first quilt of yours is magnificent. Wow! I’d love to win that little bundle of Lakeside fabrics. Thanks for the chance to win. I loved seeing your quilt pieces, and the one you did for Schoolhouse was so wonderfully quilted and beautifully colored. Thanks for the chance to win some of the fabrics. Love your fabric design. And your first quilt. I started one, but never finished when I was younger. Love your new line and the quilt pattern with the anchor-I will definitely have to make that for my water and boat-loving husband!! Thanks for sharing!! Lakeside GAtherings is so pretty! I’d love to make a half square triangle quilt with those fabrics! Thanks for showing your first quilt, love it! You have become a favorite designer if mine..I’m starting to get into wool appliqué and love your patterns.nyhanks for the opportunity to win some fabric! I’ve been a more modern quilter, but lately I’ve been loving more primitive fabrics. I have enjoyed getting to know a little bit about you and your fabrics. Funny that you have been trying to use more white, as I’ve been trying to use less! My quilts are generally 50% to 80% white. I love white! It is my favorite color, but I am trying to challenge myself. Thanks for the fun. Your Lakeside Gatherings is a wonderful collection! So versatile for lots of styles of quilts for various recipients. Your quilts are beautiful. They make me think of my grandparents! I love your two color quilt. For a first quilt, it is beautiful. My first quilt isn’t even close to that good. I love the new fabric line and can’t wait to see it in the shops. Keep your fabulous designs and fabrics coming. I love them all.